A couple of weeks back I found myself panicking about my outfit to a wedding. Rather ridiculous as everyone is always busy admiring the beautiful bride… Nowadays wedding invites are few and far between so I had no intention of buying anything new for the event. I chose to wear my Geo dress (pattern review to come), adding wedge heels and a handmade leather clutch. A few months back I picked up a large bin bag of leather scraps, time to have a play, create a DIY clutch and take my outfit up a notch. 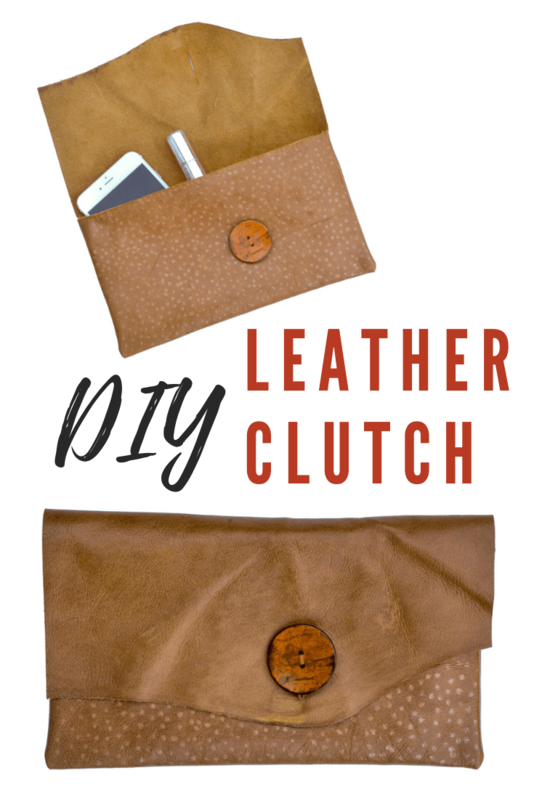 This DIY leather clutch takes less than an hour to make, add as much glam as you like with metallic dots. It is a perfect last minute gift. 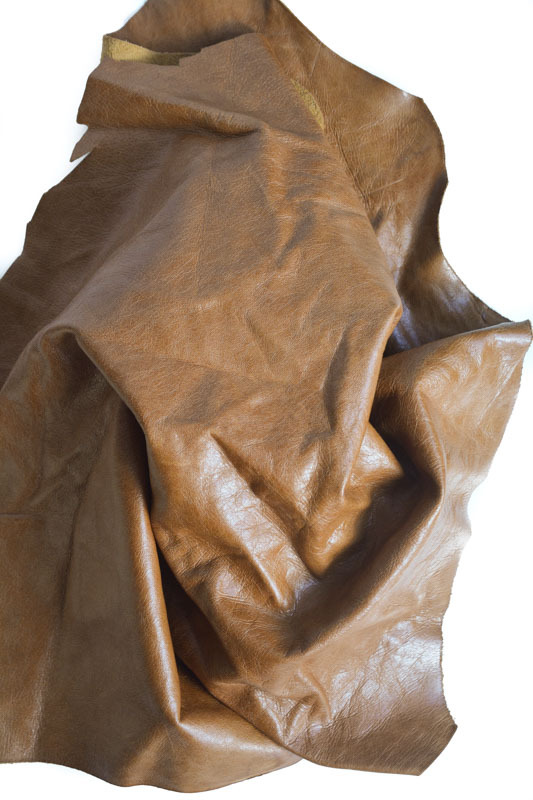 If your leather has a crumpled look you can carefully iron. 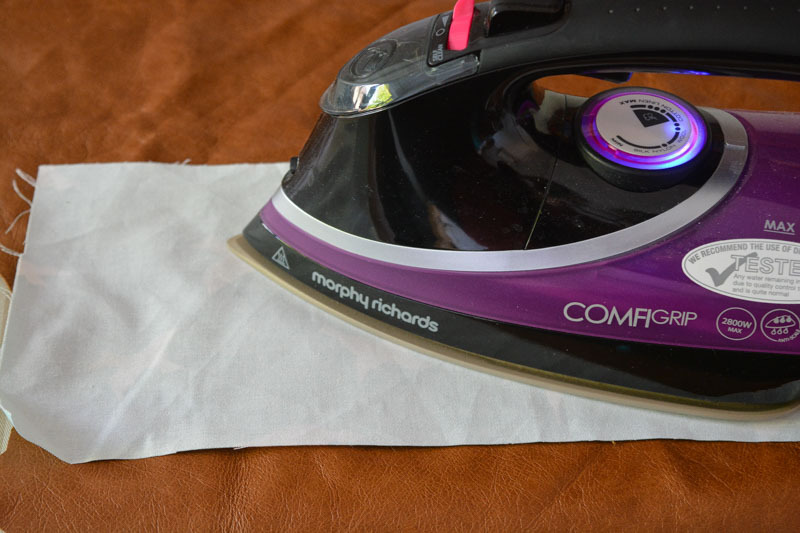 Always place a cotton cloth between the iron and leather, be careful not to burn the leather by keeping your iron on low. 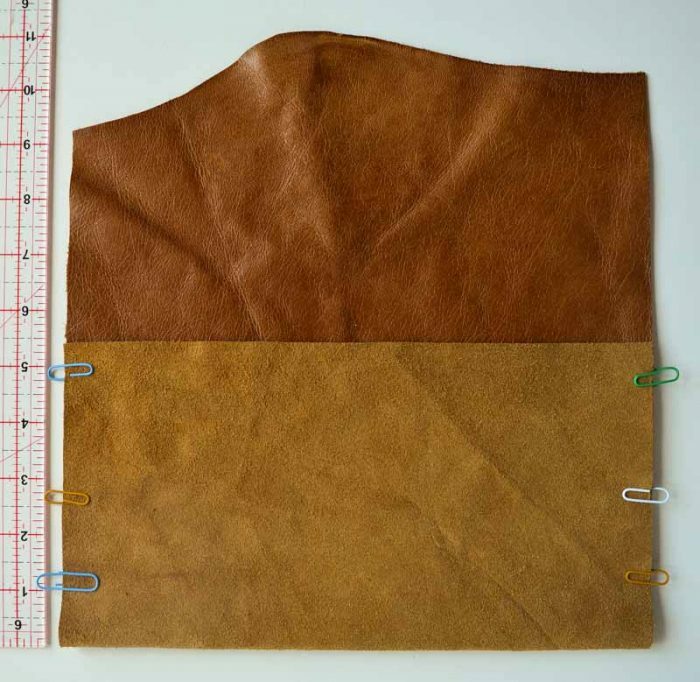 Cut out the leather, one side 16, the opposite side 14.5” and the width 10” I have chosen to keep the wavy edge of the hide for the closure of my clutch, alternatively you could cut a wavy edge. Fold the straight bottom edge up 5 1/2”, so the right sides are facing. Hold with clover clips, if you don’t have any you can use paper clips (avoid pins as they will make permanent holes). Stitch 1/8 seam allowance down each side. 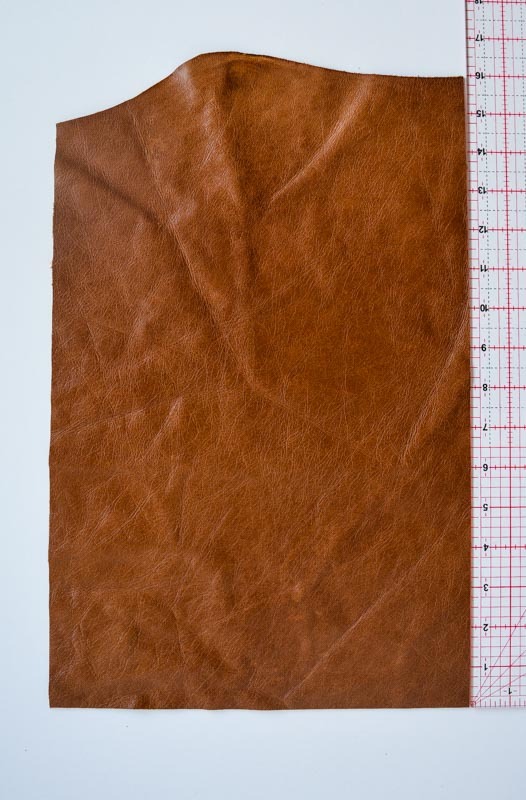 I highly recommend using a leather sewing machine needle and lengthening your stitch. 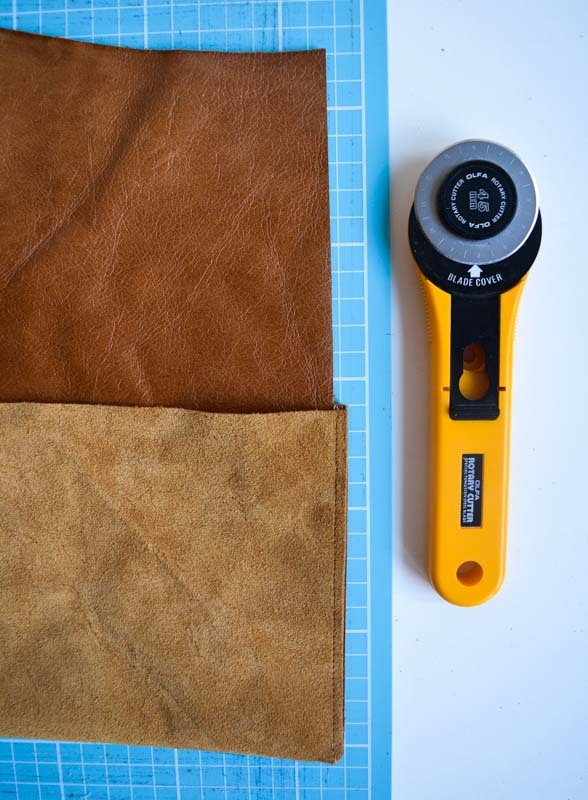 You may wish to check your tension on a scrap of leather first. 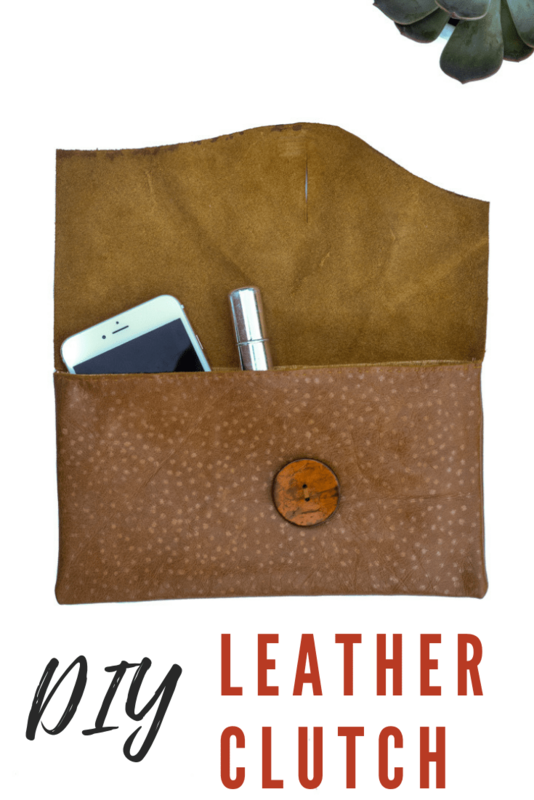 Carefully trim the closing flap of leather 1/8 off each side so it matches the width of the bag. 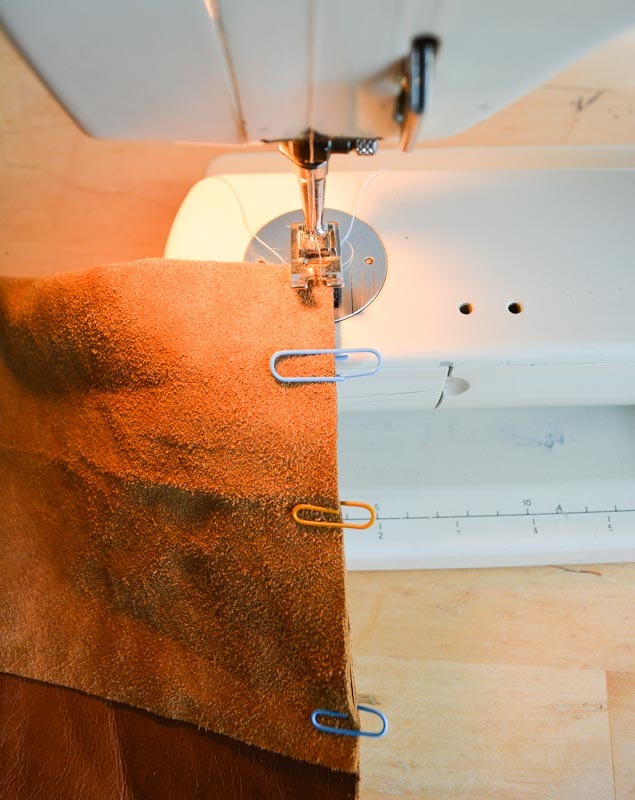 Choose the placement of the button closure and cut a button hole for the button. 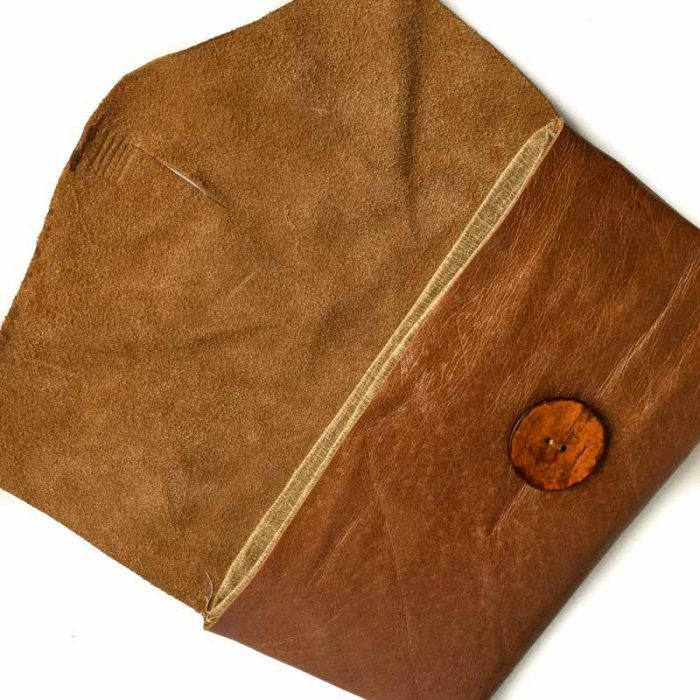 Sew the button onto the front of the bag. 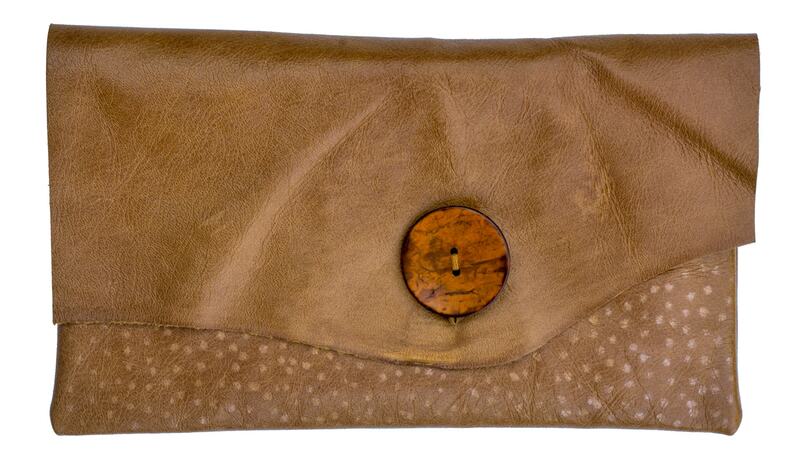 Dependant on your leather you may wish to add stiffened lining to give a stronger form to the finished clutch. To do this cut out stiff interfacing measuring 10 6/8 by 9 6/8. Follow the manufacturers instructions and iron centrally to the wrong side of the lining fabric. Along the 9 6/8 edges fold over the fabric to the wrong side and glue in place with a glue stick. 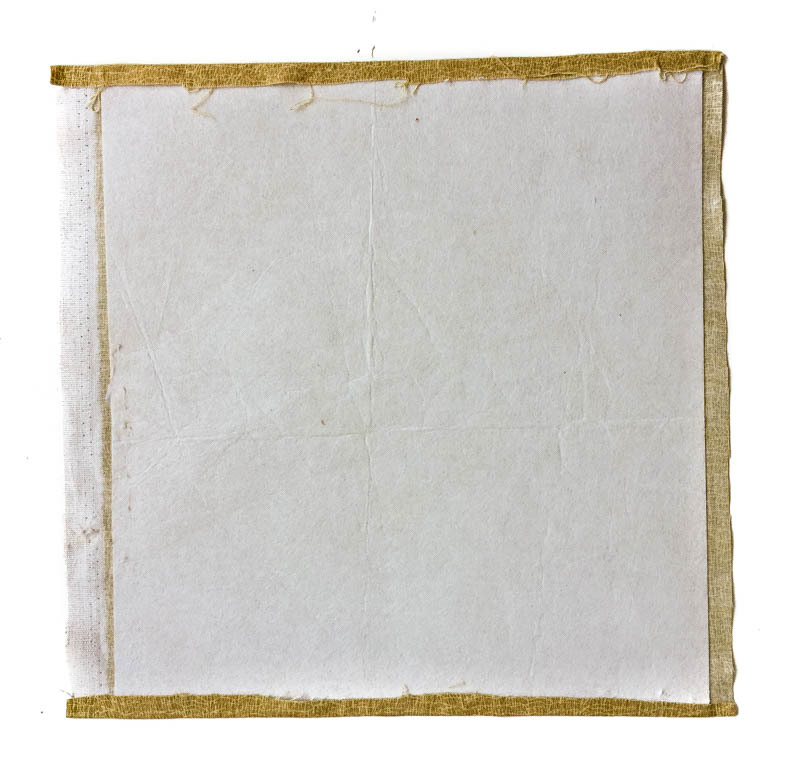 Fold your lining in half, right sides facing. Stitch with a 1/8 seam allowance. 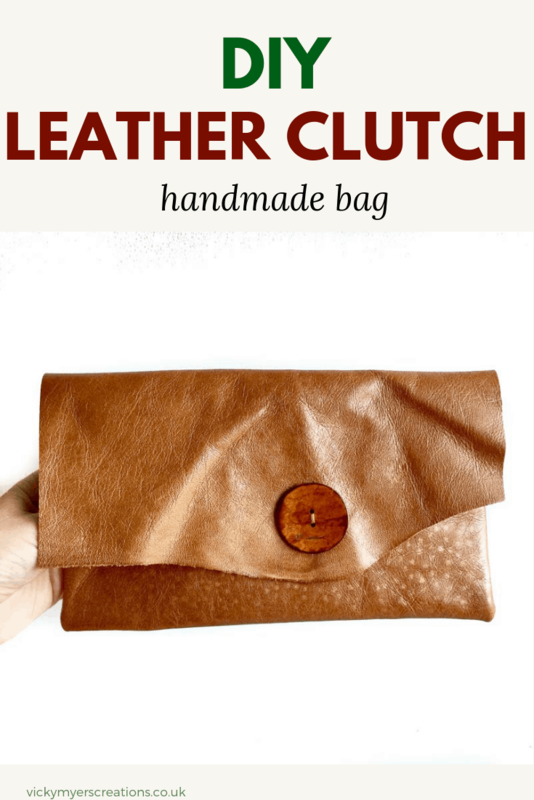 Add glue along the edge of wrong side of the lining and place inside the leather clutch. 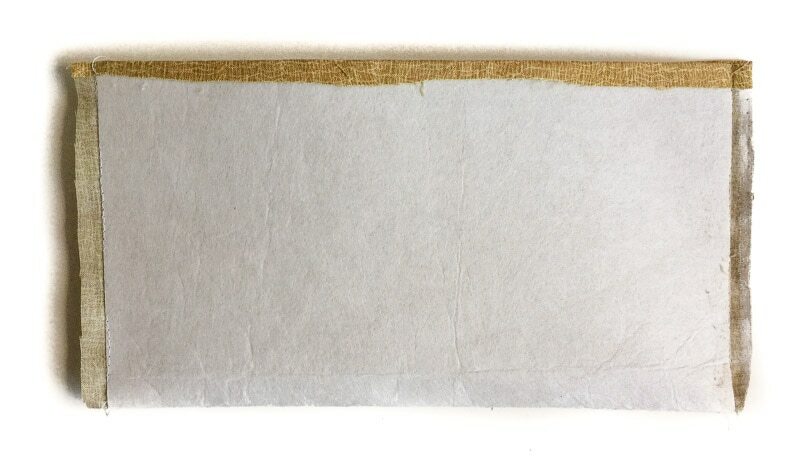 You may prefer to hand stitch this in place using a strong upholstery needle. 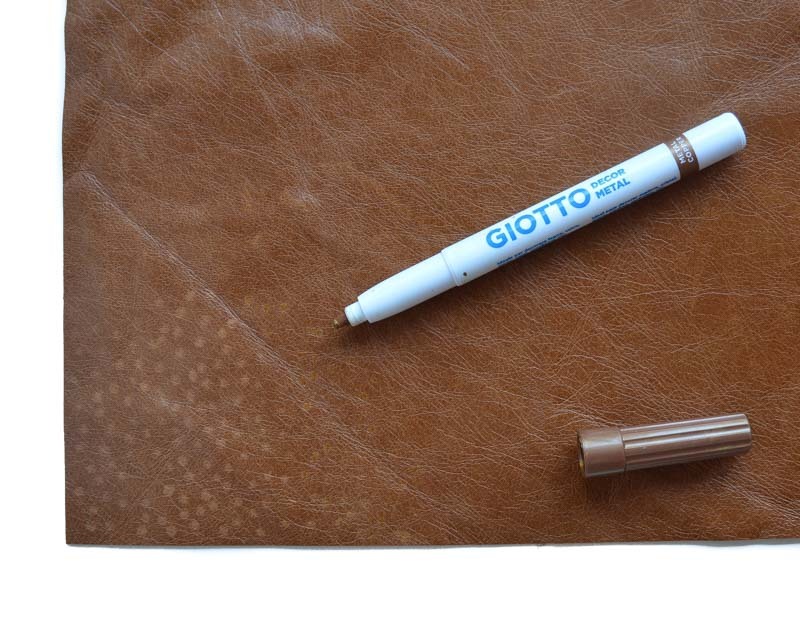 I am tempted to make a few leather clutch purses, to have a play with Giotto decor pens adding a higher contrast pattern. Check out all my the free bag patterns here.